Technically an easy scramble. 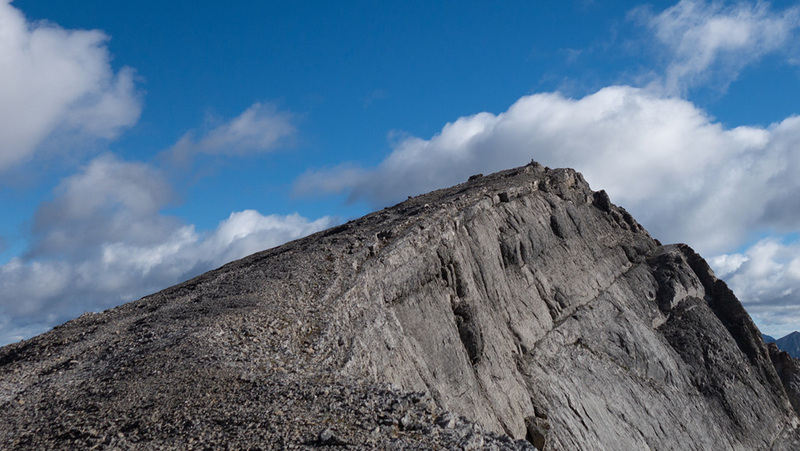 The required high traverse is not recommended when snow is present. Scramblers have long scorned the traditional approach to Middle Sister (a.k.a. 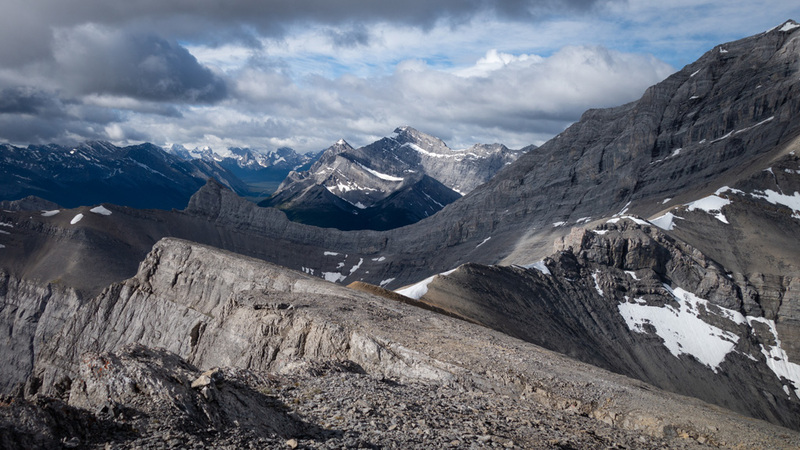 Hope Peak) via Stewart Creek for being endless and unenjoyable, so much so that they often save one of Canmore’s signature mountains for marginal condition days where they would prefer to be anywhere else, other than at work. 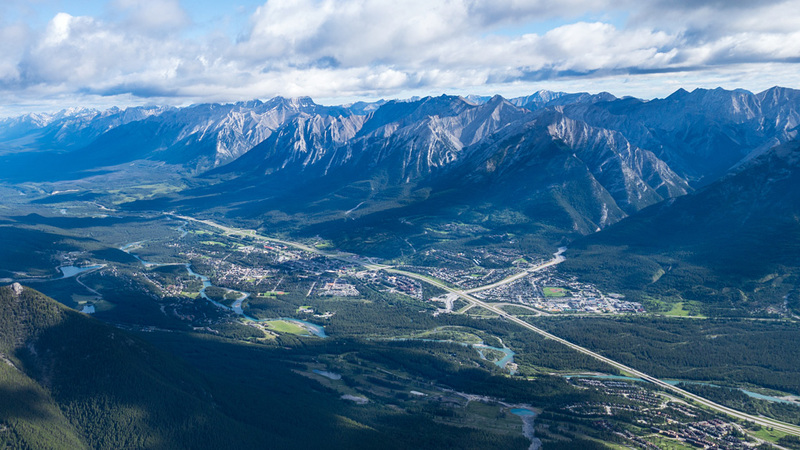 Now, with the town expanding and the construction of new neighbourhoods creating access challenges, it seems that even fewer people are bothering to ascend the mountain. Thankfully, there’s another way that should interest scramblers. 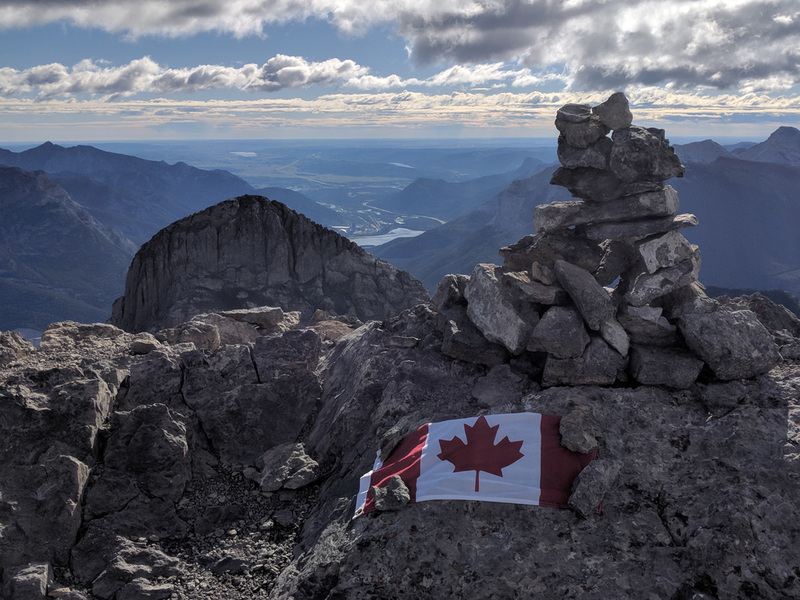 For the second time in four years, Canada Day found me working my way up one of Canmore’s Three Sisters, in a gentlemanly fashion. 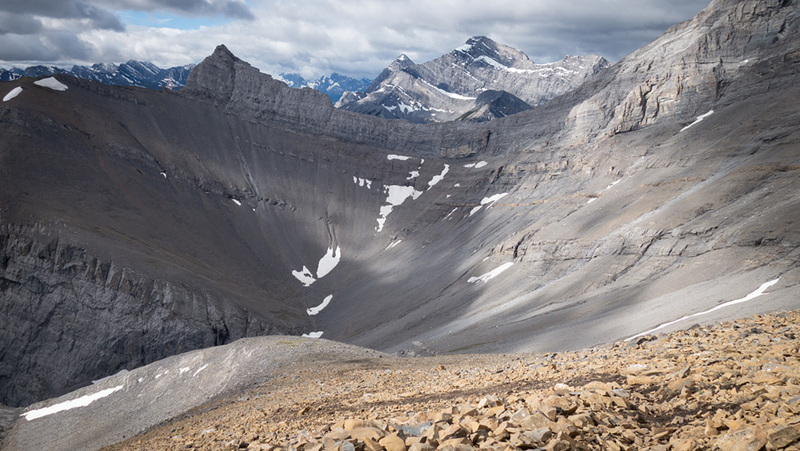 At the suggestion of keen-eyed friend Marko Stavric, I wanted to see if one could link a nearby high point known as “The Orphan” with Middle Sister via a vast scree bowl flanking the east side of Big Sister. 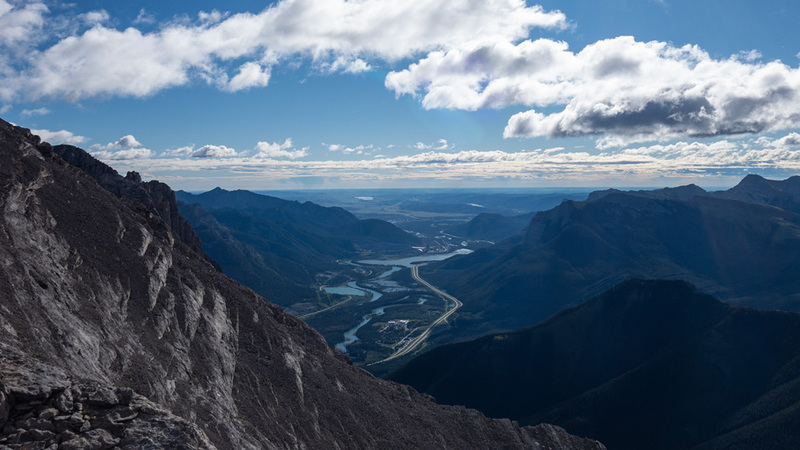 It not only worked, but between its technical ease, significantly improved views, and the bonus of a multi-summit day, this new route should become the established way to go. On this particular day, the best part was that the route was fast. Knowing to expect foul weather in the afternoon, I left the trailhead at 6 am hoping to summit Middle Sister within 5 hours; resigned to the probability that I'd get rained on for much of the descent. I made it back to my car within 5.5 hours, which was just as well. The weather soon chose to celebrate the day in the most Canadian way possible, unleashing a “blizzicane” upon the unsuspecting front ranges of the Rockies. 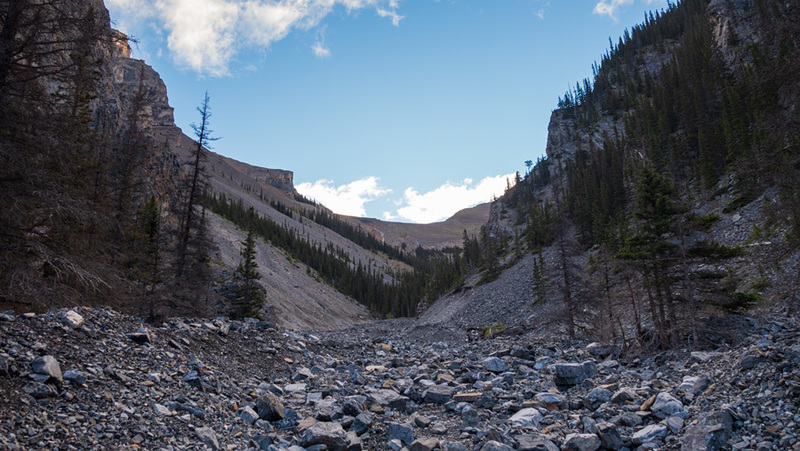 A trip up The Orphan begins from the Driftwood Day Use Area which is found on the northern shores of the Spray Lakes. 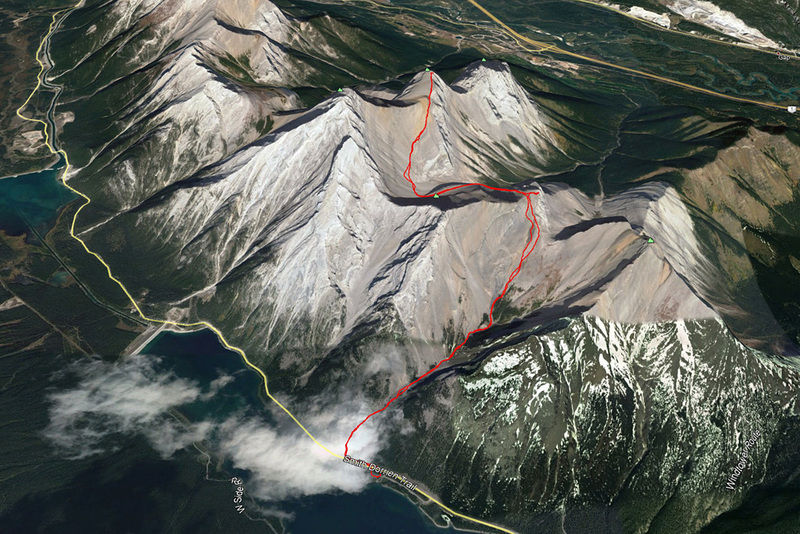 To get there, follow the Smith-Dorrien Trail out of Canmore and continue until you see the day use area on your right, roughly 3km past the Spray Lakes West Campground turn-off and its dam. After arriving, drive through the day use area until you reach a circular area beyond the boat launch to park. When geared up and ready, climb up the hill through some light brush and then walk about 250m to your left (west) before entering a broad creekbed on your right (as seen in photo #1 in the gallery). 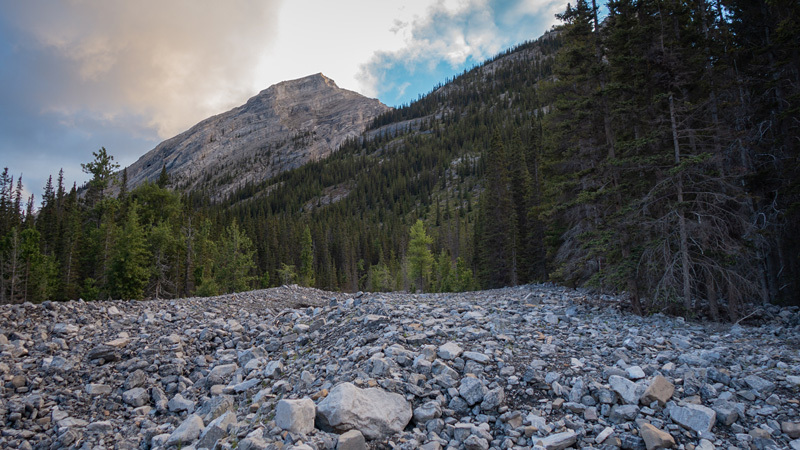 Although I had read some complaints about travel along this creekbed, I found it to be no problem at all. 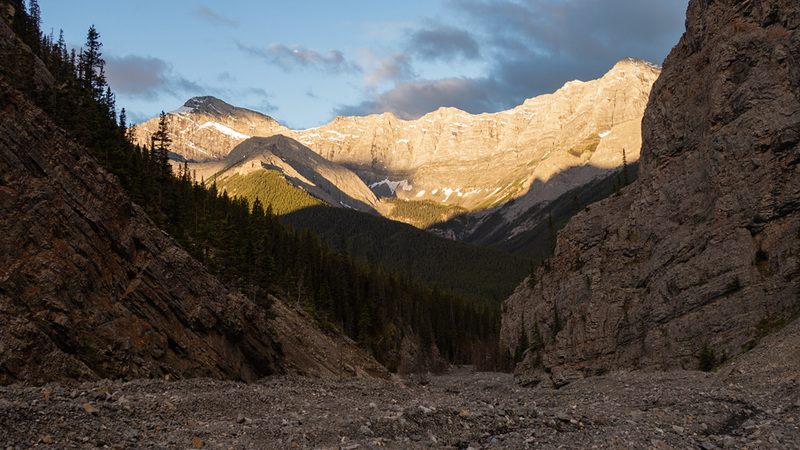 The rocks weren’t shifting underfoot, past traffic had formed many sections of trail to follow, and I found myself making fast progress up the creek towards the once distant valley headwall. Within 40 minutes, I reached a key point that I called the “trident” – where the creek branches in three different directions. You’ll be happy to know that you can’t go wrong at the trident, you can only make things mildly harder on yourself. Ideally, you will take the leftmost branch, following an established trail on its right side bank. I would say that this would be difficult to miss between the cairn, a few pieces of flagging tape, and a faintly visible trail... but then I saw a group of three ascending between the two rightmost branches upon my return. So there you go. Not long after departing the trident you'll encounter the next landmark on the trip, that being the “table rock” referenced in multiple trip reports (photo #4). It’s an ideal spot to take a break. Shortly past the table rock, the trail drifts to the right and passes through some light forest before breaking through the treeline to wide open slopes. 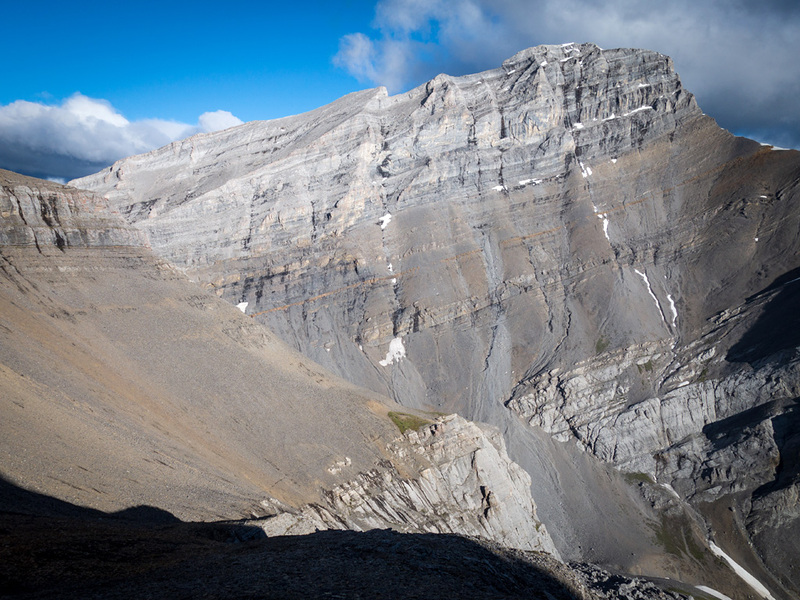 At this point, aim for the most solid looking lines as you grind your way up to the crest of the headwall. Don’t be surprised if the winds intensify considerably as you near the pass. I put my helmet on, not because I feared for my safety, but because my hat’s lack of chinstrap was becoming a sudden and regrettable liability. 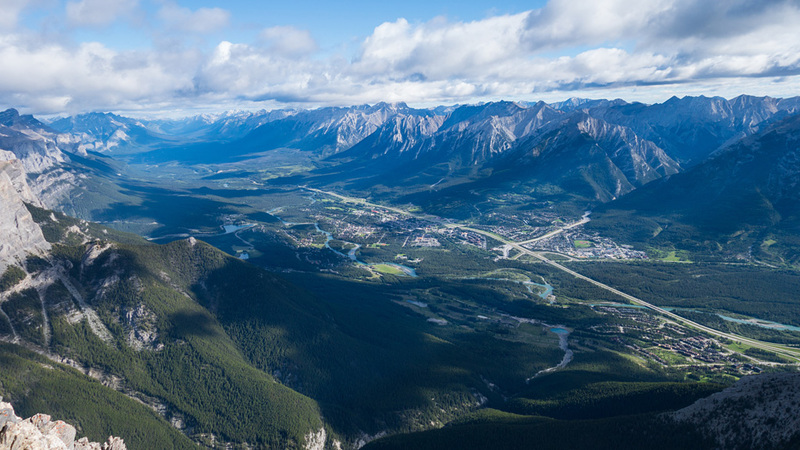 The pass provided me with the first views of the day into the verdant Bow River Valley. 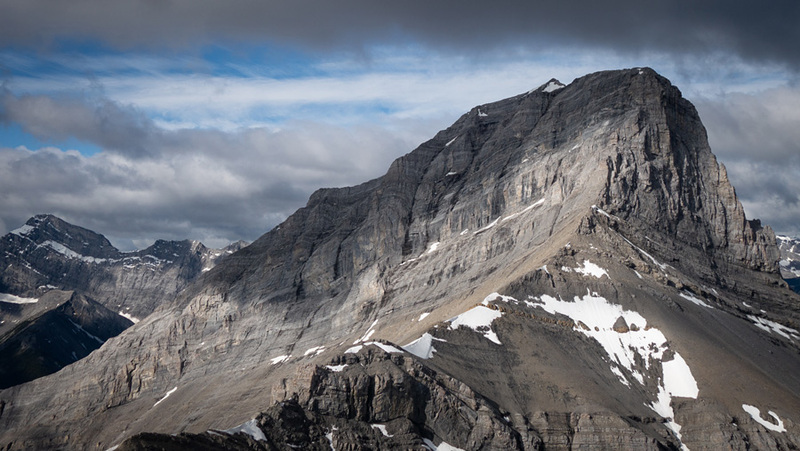 I was surprised at how achingly close Rimwall’s summit is to this point; if it weren’t for a continuously pesky 5-6m cliff band near its summit, this could easily have been a tale of a three-summit day. While we take a moment to lament that possibility, the good news is that you're only a 15-minute hike away from The Orphan’s summit. 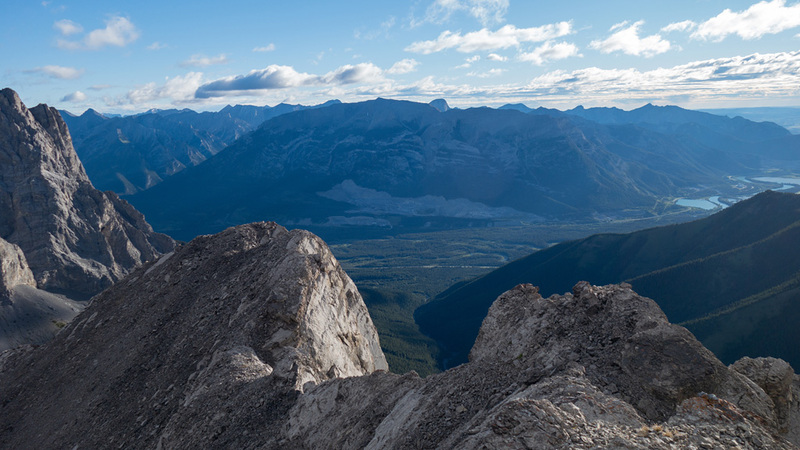 Despite being the lowest high-point along its ridge, this rocky outcrop overlooking the Bow Valley has been granted a local name and is considered a legitimate summit. Reaching it had only required 90-minutes of hiking (same as Ha-Ling), and only a few moves of easy, hands-on scrambling are needed to traverse from its false summit to the true one, and its clearer viewpoint over the valley. 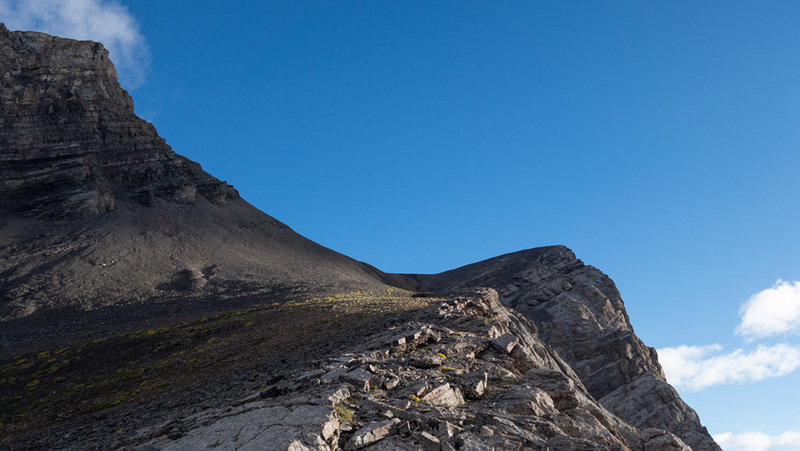 The traverse from The Orphan to Middle Sister can look wild in pictures (see photos #10 and #11), which is probably why this route wasn’t established sooner. 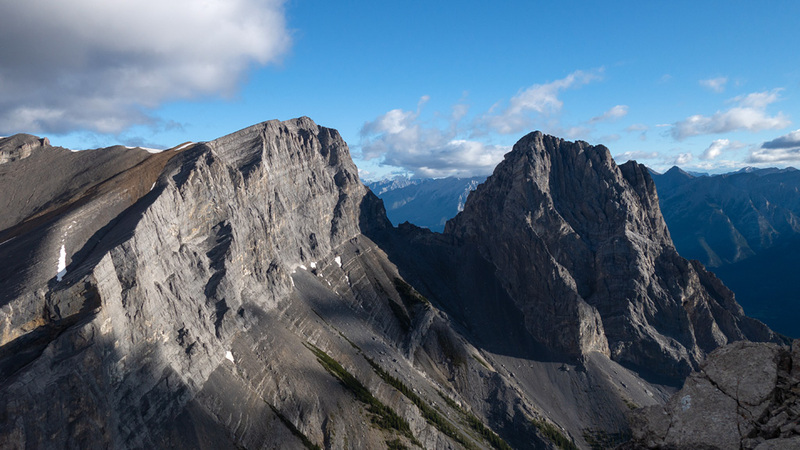 However, it’s hard to project a human scale onto a distant mountain landscape, and the reality is that the entire ledge linking The Orphan to the “Big Sister Bowl” is gently sloped and quite broad. 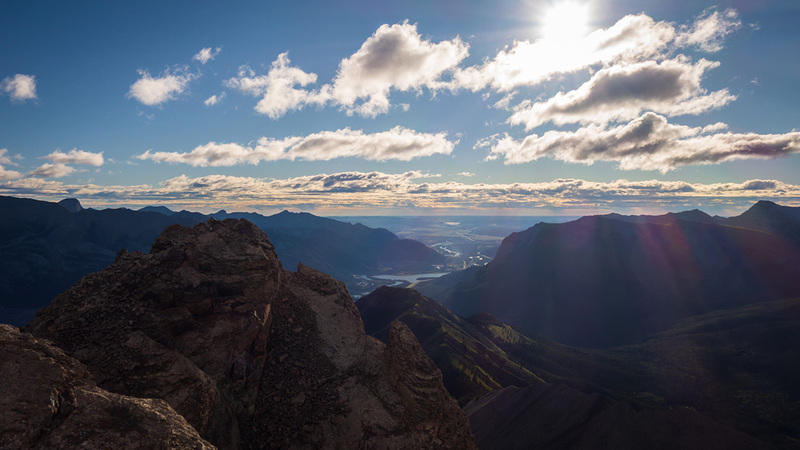 It can be hiked safely, but be sure to give the cliff top a wide berth and recognize that it’s a summer-only route. 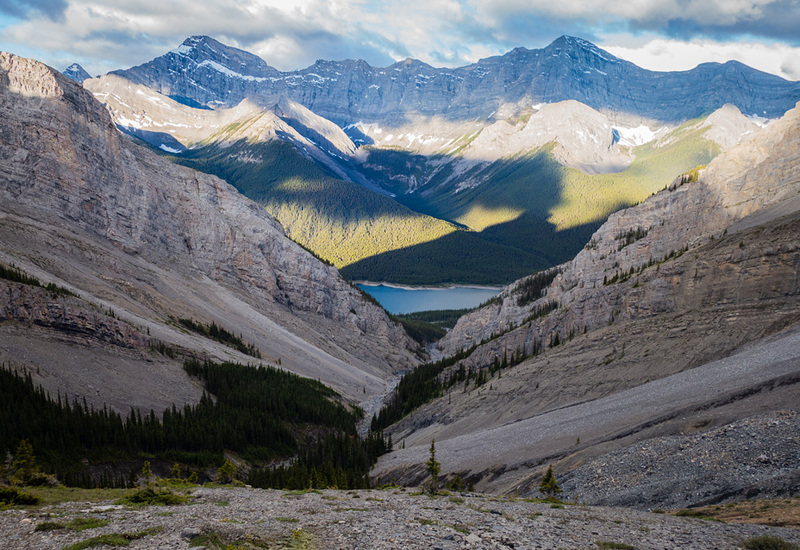 Snow and ice would completely change the dynamic here; during shoulder seasons, the traverse should be visible from the Trans-Canada Highway for easy scouting before you head out. 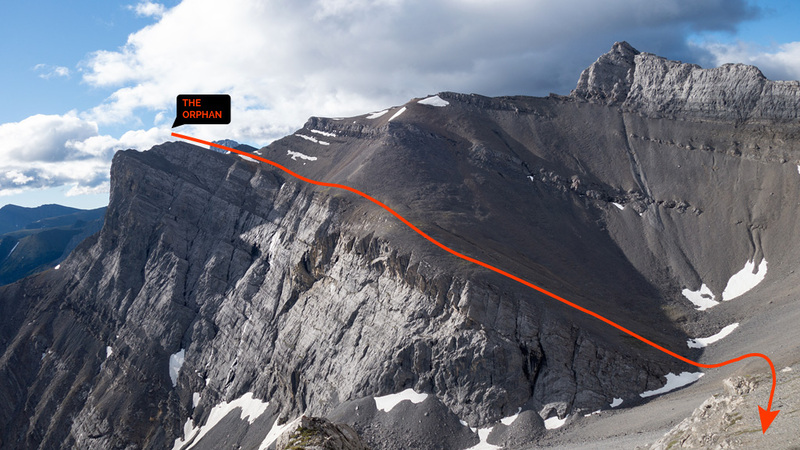 Dropping from the summit of The Orphan, I set out along the traverse’s ledge directly towards Big Sister, curious as to what difficulties I might encounter on my descent to the bowl. 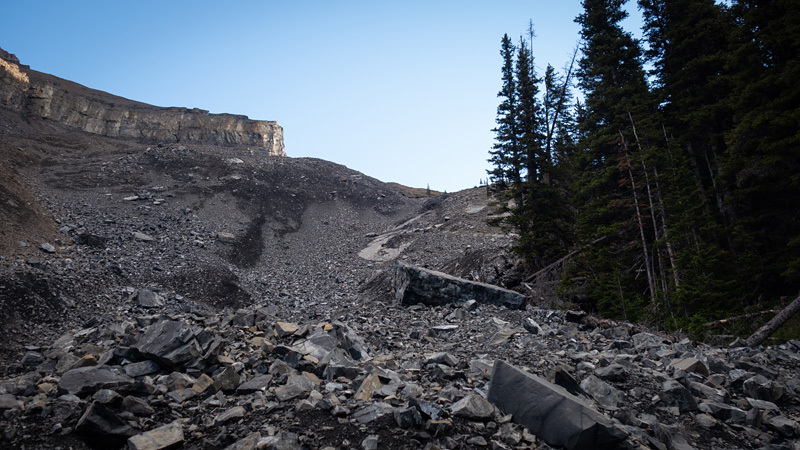 After travelling for a while on stable scree, I came around a corner and was delighted to see a mellow scree ramp all the way to the bottom; and not a stone’s throw away from where the Kane route arrives from Stewart Creek, before curving back up Middle Sister. 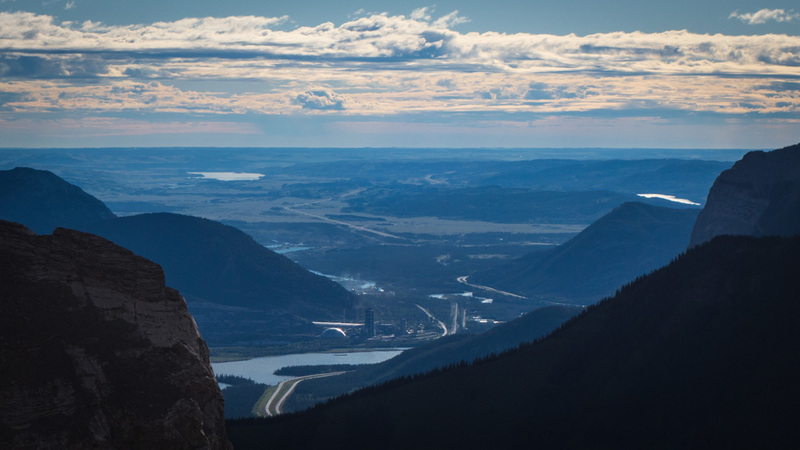 Gazing along the TransCanada highway and Bow River, past Lac des Arcs, to the prairies beyond. Unfortunately, you lose about 280m of elevation when descending from The Orphan and must make all of that up, and then some, during a long slog up the ramp that is Middle Sister's summit ridge. 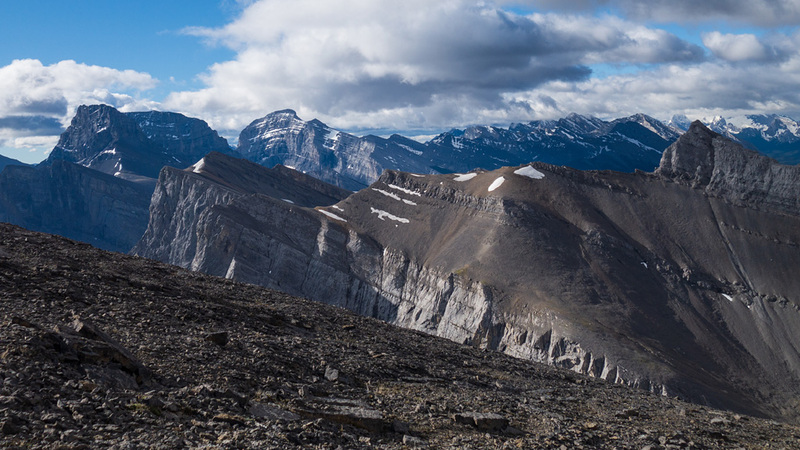 From the bowl, you want to take a higher line to your left (northwest) while keeping your eyes peeled for one of the many well-trodden trails on this mountain. Finding one will make your life better, but will still leave you yearning for solid rock. 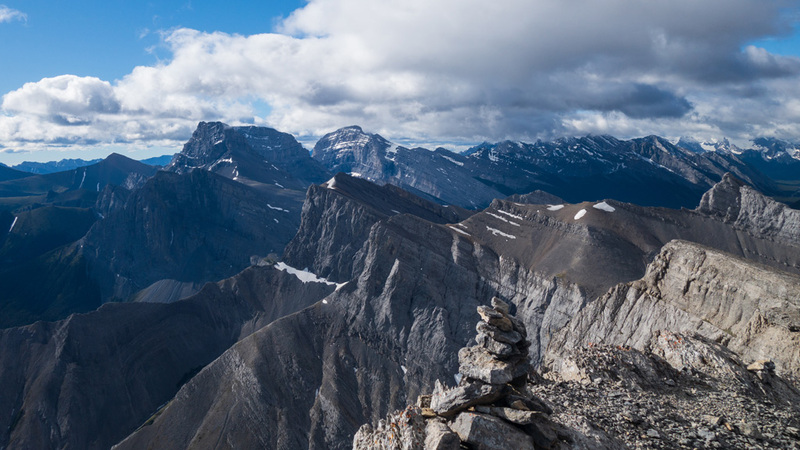 You won't find any, but this will cease to matter once you reach the summit (around an hour from the bowl) and are justly rewarded with a commanding view of Canmore and the Bow Valley beyond. Despite it being a Sunday and a national holiday, I had the entire mountain to myself. 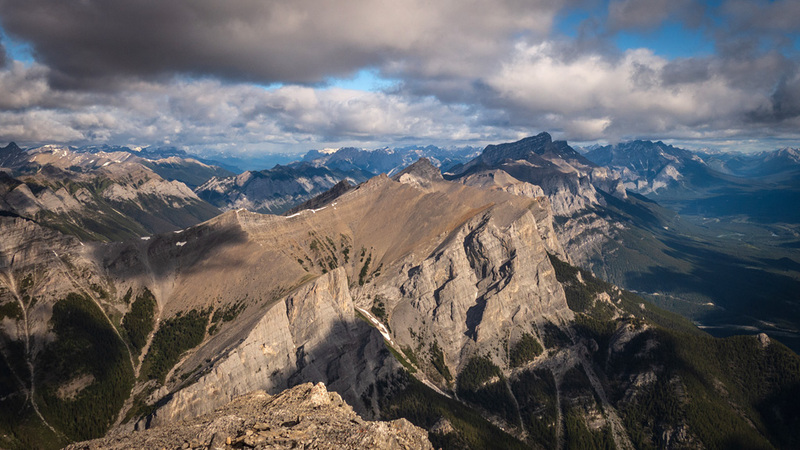 I was two hours ahead of my planned schedule at this point, but could already see white drapes of precipitation strafing ominously across Cascade Mountain and the Sunshine Village area, and knew that my weather window was already closing. After taking the requisite photos, popping a preventative Advil, and snarfing down an energy snack, I began reversing my route. The long trek back begins with a great view of Goat Mountain and Mt. Nestor. Descending Middle Sister passed quickly and pleasantly while re-ascending the scree ramp out of the Big Sister Bowl... less so. Both that ramp and the traverse, in general, will improve significantly once a few groups pass through. Eventually, I arrived back to the Driftwood Day Use Area where I basked in the deceptively warm and sunny weather in that area. It wouldn’t last. Shortly after, when merging onto the Trans-Canada, I did a triple-take at the mysteriously white appearance of my rear-view mirror. It was as though part of the level had failed to load. Checking my side mirrors and over my shoulders, I soon realized, to my astonishment, that a perfectly opaque wall of precipitation, extending from the valley floor to well above the mountaintops, was barrelling down the valley towards me. Even though I was travelling at precisely the speed limit, in a gentlemanly fashion, the wall appeared to be gaining on me. By the time I reached Highway 40, I could see the entire front ranges engulfed in this massive storm and, now being clear of it, was overcome with a feeling of giddiness. Although it doesn’t make sense, I felt that, with my precise timings this day, I had committed the perfect mountain crime. I would later find out that friends, being less crafty with their capers, had been caught in blizzard-like conditions and experienced hurricane-strength winds. I’m sure there’s a valuable lesson there.